This short course is directed toward small industrial facilities with no organized fire brigade, or large facilities that have a fire brigade, but want to train their workforce to use portable fire extinguishers. Remember, according to the NFPA, portable fire extinguishers are industry's first line of defense against fire loss. This course includes instruction on basic fire behavior, fire prevention, escape routes, as well as hands-on training and proper use of portable fire extinguishers. This course can be tailored to fit the needs of an individual facility, and yet fulfill the requirements of OSHA's 29 CFR 1910.156 and NFPA 600. 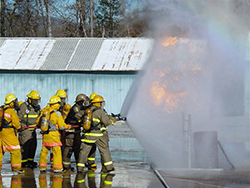 The course includes instruction on fire brigade organization, fire behavior, facility evacuation, working with fixed-fire protection systems, the use of portable fire extinguishers and 1-1/2" hose streams on live fires. 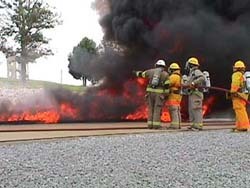 The course also involves instruction on what role the incipient fire brigade should assume if the fire is beyond the incipient stage, stressing the importance of employee accountability, coordination with the local responding fire department and support of the fixed-fire protection systems in the facility. Industrial structural fire brigades require training that is designed to fit the specific hazards of a particular facility, and yet still meet the needs of the current standard of care (1910.156 & NFPA 600). ERS's structural firefighting programs do just that. 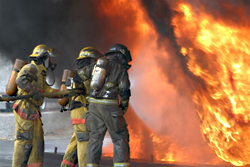 While teaching basic safety and widely-accepted firefighting techniques, we also design your training program to prepare your firefighters for the particular hazards of your facility. ERS's programs are definitely NOT the typical "structure fire" program. We guarantee that your fire brigade members will walk away from this course with a greater knowledge of how to protect themselves, co-workers, and your facility from the devastating threat of fire. And chances are, your personnel will be asking for Emergency Response Services, Inc. when the next training session is due! ERS, Inc. can also custom-design training programs for your personnel, such as Advanced SCBA Training, Fixed Fire Protection System Inspection and Testing and Fire Equipment Inspection, Testing and Maintenance. We also conduct annual fire hose and SCBA testing. Call for details!